In the beginning, there was tremendous heat, but no matter. Except for the expansion of Black Forest Observatory (BFO), little else existed in his universe. Paul B. Van Slyke's mind became heated [obsessed] with a dream beyond the creation of mere matter - to create an educational public observatory like none ever created before. The observatory and telescope already existed, in a pre-expansion state. 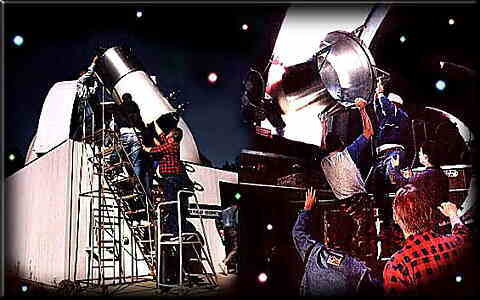 The small roll-off roof structure (see picture above), containing the giant telescope, had already given thousands of corporeal beings a "first-eye" glimpse of a night stalker known by all as Halley's Comet (see "An Innovative 17.5-inch Newtonian, S&T, 1986, p199, or the previous link). Would BFO remain static? Would it eventually collapse back onto itself? Would it expand into the cosmic void of space and time? Would it create space and time as it expanded, or would it just occupy space that already existed? At that point in time, no one knew, except Paul B. 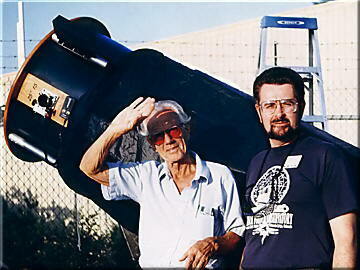 Van Slyke, founder and director of what was the largest observatory in Colorado, one of the largest public observatories in the world, an educational facility far beyond any other and unique to itself anywhere on Planet Earth. This is his remarkable story, of his fight for a dream that he alone made into a reality. Halley's Comet was actually the catalyst that created Paul's "big bang." But the continued expansion of BFO was generated by years of single-minded determination - literally fighting the powers that be. Most important, without the support of Paul's wife, Angie, he could never have crossed the cosmic void of space and time to create the viable reality that exists today. She gave him his most valuable asset - time, so he could create the reality. 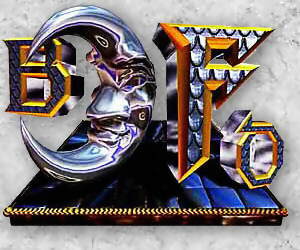 BFO was a nonprofit independent educational corporation, sanctioned by the State of Colorado as a nonprofit corporation, and listed in the national IRS computer as a nonprofit tax-deductible 501 (c) (3) organization. To accomplish this distinction was difficult for Paul, but nothing compared to his fight with bureaucracies, regulatory agencies and county hall. The requirements for a public "anything" were unbelievable to the yet uninitiated Mr. Van Slyke. But, according to retired County Commissioner Jim Campbell, Paul is one of the best speakers he has ever heard. So, after battling the Land Use Department, Regional Building, Health Department, Department of Transportation, County Planning Committee, State Property Tax Department and the County Commissioners Board, his metal had been tempered and the battle was nearly won. But, these were only the organizations that Paul considered actively hostile, where his wrong move would have meant the end of BFO. I won't even mention the passive bureaucracies that Paul had to confront requiring mounds of seemingly unending paperwork. The Land Use Department even conspired with the Transportation Department to have Mr. Van Slyke's bridge condemned so no one could drive to the observatory. There was nothing wrong with the bridge. It was actually built by Paul Van Slyke himself. The bridge was so overbuilt that it would hold a dozen tanks stacked on top of each other. The Land Use Department just didn't want a public observatory in their area. I always thought that, being a democracy, the people decided what they wanted, not the bureaucracies. Fortunately, the structural engineer that provided engineering design studies for the expansion of BFO certified that Paul's bridge was sound, and did so with Paul before a Regional Building Committee meeting, which the engineer previously served on. To retrograde just a bit to simpler days before Halley's Comet, there were many things that Paul had to consider in building a public observatory. In choosing the site, he had to consider an equilibrium between public accessibility and, of course, dark-sky conditions. Located at an elevation of 7500 feet and being in a slight valley surrounded by trees helped block light pollution from Colorado Springs and Denver. The native Ponderosa Pine surrounding the site actually created a dark bowl to observe from, as atmospheric distortions below 20 degrees elevation are too extreme to observe through. He had heard that a natural, grassy, treed area next to water is best for improved "seeing," and that's exactly what he found for BFO's permanent home. 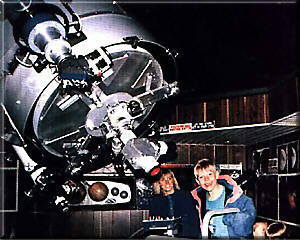 Paul built this spectacular instrument from society's discards (see Sky and Telescope magazine, February 1986, pp199-201) so he could personally observe Halley's Comet. He found that thousands of other space enthusiasts wanted to observe Halley's Comet too. So Paul decided to offer public viewing sessions at $5 a person, which gave him the funds he needed to purchase all the materials for the stage two [pre-big bang] expansion of BFO. 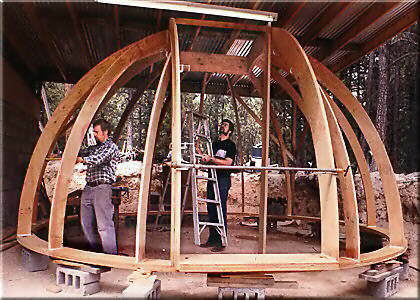 Alan Raycraft (another astrocrazy like Paul) built the dome out of laminated plywood and tempered masonite, although not for free, at least for a very reasonable price. Architectural blueprints were drawn from Paul's specifications and donated to his cause by Harold Holding, a local architect. With almost no help, Paul began construction on the lower building structure. This was actually an extension built on to the original small observatory structure, with a simple motorized roll-off roof, that gave those thousands of "sponsors" that spectacular vision of Halley's Comet the year before. After Paul set and poured the 3000 pound isolation pier (a 3-foot diameter sonotube set into the ground about 5 feet), a local concrete crew volunteered their time to set the forms and smooth the concrete for the floor. Another one of our contributors, John Morgan (mentioned above), a structural engineer, did a complete structural analysis of the building and found the most economical way to support the dome was to install steel beams. Paul then built the walls and supporting structure, single-handed, according to the structural analysis provided. 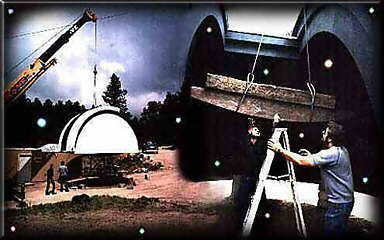 The dome rotates on a 16-wheel flotation system designed and fabricated from dumpster casters, which Paul acquired from a scrap metal yard for $5 each. The wheels are equipped with roller-bearings providing very smooth dampened movement. Before motors for dome rotation and shutter control were installed, Paul had to open the shutters by hand and rotate the dome using a heavy rope. This was one thing that Paul could not do single-handed. Two people pulling together could adequately rotate the dome, but public groups got in the way, so "muscle power" finally gave way to "motor power." Paul designed and built a worm-gear, chain and sprocket drive system that rotates the dome using a golf cart tire. It has worked with great efficiency, through ice packed winters without fail. Even after Paul had installed his 17.5-inch Newtonian telescope on its German equatorial mount under the new dome, he was thinking "bigger big bang." The shutters on the new dome had a 50-inch opening. That meant that a 1-meter telescope would adequately fit under the existing dome. But the optics would have to be Cassegrain to allow public observing from the ground, and Cassegrain optics cost tens of thousands of dollars. Since BFO is a nonprofit organization, he decided to write proposals for grants to purchase the optics. Well, two years later, Paul had submitted over fifty proposals and had been turned down by everyone. I had read a few of the proposals myself, and they were very well written, and each one followed the guidelines of every foundation. Paul finally gave up in frustration and has never submitted another grant. Luck would have it, a local business had given Paul a very expensive professional pneumatic mirror grinding machine to use in his machine shop. Since Paul didn't grind telescope mirrors, he really had no use for the aparatus. He took total advantage of that luck, thinking that a commercial optical fabrication business might want to trade the machine for a large set of Cassegrain optics, so he called all the shops in the country. Eventually, he found one in Utah that was willing to trade the machine, plus cost of materials, for a 30-inch Dall-Kirkham Cassegrain optical set. After a year of anticipation, the optics were finally completed and ready for pickup. With $2600 for materials in hand, and the mirror grinding machine loaded in the back of a friend's 4-wheel drive, they hit the road for Salt Lake City. Nothing would stop the obsessed astro-fanatic on this quest. A terminal breakdown in Gunnison, Colorado didn't even turn them back. They rented another vehicle, had some people at the garage help load the very heavy mirror grinding machine in the back, and off they went. They drove straight through to Salt Lake City, dropped off the machine and the money, picked up the mirror set, and headed back shortly after midnight. His friend wanted to stop for the night, but Paul wouldn't hear of it. He drove straight through the star-filled night while his friend slept. Paul's wife Angie met them in Gunnison with another vehicle. They had his friend's 4-wheel drive towed, and headed for Colorado Springs. For Paul, his 48 hour non-stop journey wouldn't end until the optical set was safe and sound in his observatory's machine shop in Black Forest. Paul did not waste that year on anticipation alone. During that time, he was experimenting with Tesla coil technology. 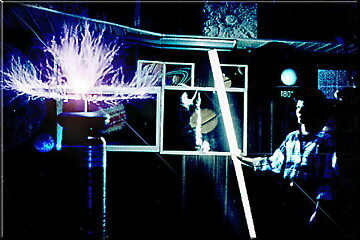 Six months of experimentation had created a new type of giant glass/silicone capacitor of his own design, and a prototype million volt Tesla coil capable of high voltage streamers over two feet long. He had built the coil for spectacular demonstrations of electrical principles in the observatory. It was the greatest motivation stimulator for students I had ever seen, but the Tesla coil generated such a tremendous electrical field, it blew out the computers in the observatory, so it had to be removed. Paul's Tesla coil still sits in the observatory, unused. Paul wanted to create a "Teslarium" [as Paul calls it], but time and money never became available for that unique project. Paul was very busy during that year of optical anticipation. 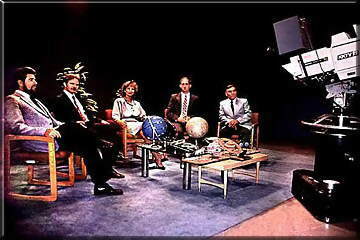 He also taught astronomy for that year at the University of Colorado under an honorary teaching position. And found time to complete the new tube assembly and mounting brackets for the new optics. Paul was ready to install the new telescope in the observatory as soon as the optics were completed. Unfortunately, the tube assembly was too large to fit through the door and had to be hand-fed through the observatory shutters. 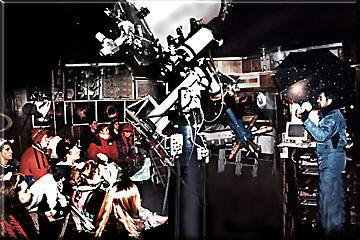 This required the participation of at least two dozen area friends and volunteers from the local astronomy club. That eventful moment finally came and went, October 20, 1991, with only one problem. After installation, the counterweight broke at a critical weld and the new tube came crashing into the mount. Paul held his breath while he looked inside the tube for a disaster - a broken primary mirror? Luckily, the priceless mirror was unharmed, and the repair of the counterweight was minor. Many more years of upgrades and new equipment followed before the dream became a true reality. The larger upgrades included a new 20" Byers drive and a heavier 3.5-inch diameter solid steel telescope shaft in the right ascension (RA) axis. Paul then moved the old RA axis to the declination axis, which was actually an old control rod drive out of a nuclear power plant. You see, before Paul moved to Colorado Springs and created BFO, he had acquired an impressive engineering background. For about 10 years, he was involved in R&D with experimental transportable mobile nuclear power plants for the military. Nothing harmful, these were just mobile power units (land and sea) to provide electricity for base camp deployment of troops. 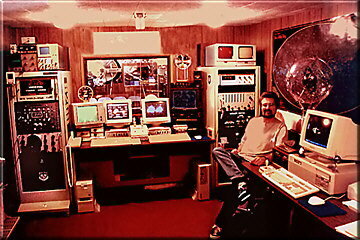 During these years, Paul also designed and built, not only his own computers from the motherboards up, but the telescope's robotic hardware interfaces from scratch. Paul and a friend designed and wrote the software that wields the telescope from the new warmroom. The 12-inch diameter secondary mirror was stepper motor remote controlled that gave you an adjustable back focus up to 3 feet! 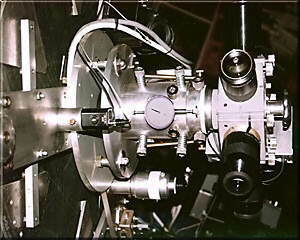 The visual back wielded a custom built 2.75" motorized focuser and, for visual sky tours a gigantic 2" format [the first] Hexagonal. 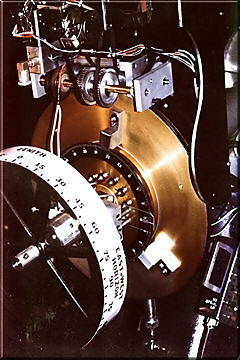 The telescope and dome were closed-loop voice interfaced, with access by infra-red remote microphone. You just talked to the telescope, and the telescope talks back to you and told you that it's moving and when repositioning is complete. Very impressive engineering! Paul was thinking about building an alpha wave (thought) control system so his brain could directly interface with the telescope, but that was just a thought, without fruition. BFO is a monument to the ingenuity and dedication of one man, Paul B. Van Slyke. Many people consider him a genius. I've seen people behold his observatory in total awe and disbelief, when they realize that what they're experiencing was created by one man - alone. Paul doesn't quite know how to take such a compliment, so he just says, "I'm not smart, I'm just stubborn." Maybe so? There are few testimonials to the true achievements of one person. Today, it takes a team of engineers, etc. to accomplish anything. Paul built BFO with his mind, body, blood, sweat and tears - without money, with nothing but a dream. Paul's abilities and single-handed achievements are as rare as a dinosaur, and maybe as extinct in today's society. 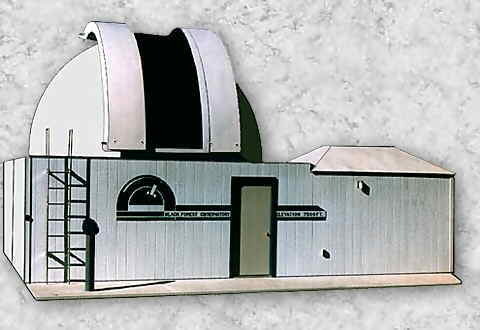 BFO's main telescope, in its final form (pictured at left), incorporated a 30-inch f/9 (fairly fast) Dall-Kirkham Cassegrain optical system (30" f/3 elliptical primary with 11.75" 3x spherical secondary multiplier) created by Intermountain Optics (IO) in Salt Lake City, Utah. IO manufactures optics for the aerospace industry up to about 80 inches. THE BASE SUPPORT PIER was created by inserting a 3-foot diameter Sonotube 6-feet into the ground and filled with concrete. A half-inch gap existed between the concrete column and the concrete slab for the floor isolating the column from the slab. Eight lag bolts were set into the concrete to attach the 12-inch diameter, 4-foot high, 3/4-inch thick cast iron pier that would support the German equatorial mount and tube assembly. 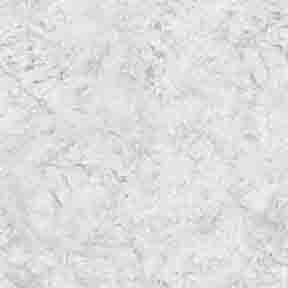 Cast iron has the highest vibration damping factor of any of the common metals. Oh, before any concrete was poured, a 4-inch diameter raceway was layed between the center of the column and the outside floor in the direction of the warm room. This eventually held miles of cabling to control the scope. THE GERMAN EQUATORIAL MOUNT has a 3.5" solid steel shaft riding on 6-inch diameter ball bearings in RA. 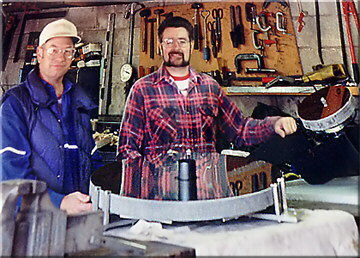 To provide further support, I built (what I call) a thrust bearing stabilizer consisting of a 16-inch diameter by 1/2-inch thick circular plate of steel (ribbed on the bottom for additional support) attached to the right ascension housing accompanied by three ball bearings attached to the declination housing. These declination bearings rest on the right ascension steel plate and simulate the stability of an much larger diameter right ascension shaft. THE TUBE ASSEMBLY is formed from a large sheet of 1/8-inch thick anodized aluminum, which was then rolled into a cylinder at a local sheet metal shop. A four-vane spider and custom secondary mirror cell are controlled by a stepper motor, linear motion/secondary focusing system that provides a versatile 3-foot back focus range at the push of a button. 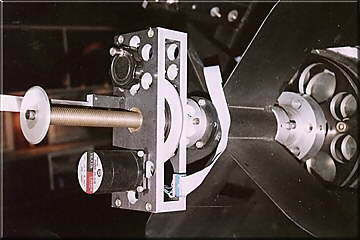 The secondary mirror cell is supported by a full linear and thrust ball bearing mechanism providing "no shift" secondary focal point changes. Secondary mirror movement is controlled by remote stepper motor and is computer interfaced from the warm room. The visual back consists of an 18-point flotation cell with a custom built integral 2.75" format remote stepper motor controlled rack & pinion focuser with analog dial indicator positioning. 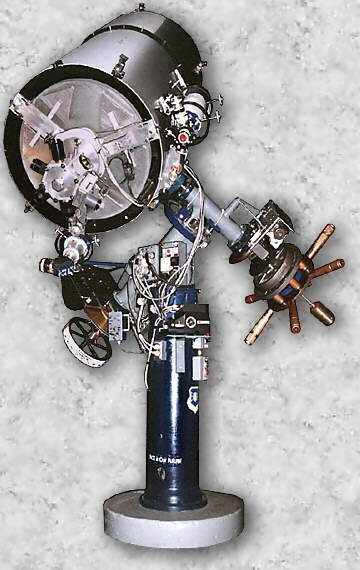 Hanging from either side of the tube assembly are two fast refractor viewfinders consisting of a 6", f/4.4 refractor with rare 2" format erect image amici roof prism diagonal and a 60mm helical focus Erfle eyepiece with illuminated reticle, and a 5", f/5 refractor with rack & pinion focuser and 32mm Erfle eyepiece with illuminated reticle. I went to extreme lengths to assure a structurally stable, yet lightweight tube assembly, specifically to overcome the possible inadequacies of the mount discussed in the following section. 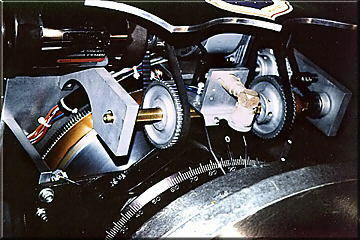 THE DRIVE SYSTEMS: The right ascension (RA) axis has a 20-inch Byers worm drive with a low periodic error stainless steel worm, and a 12-inch Mathis drive on declination. The mount actually has three independent drive systems, a synchronous motor tracking system (RA only), stepper motor dual axis drives with digital IC controllers, and DC servo motor dual axis drive system. The DC servo motors have tachometer feedback for very accurate speed control. The DC servo motors are controlled by closed-loop digital IC velocity feedback amplifier/controllers with ramping and maintain full torque (5 in/lbs) from 3 to 3000rpm. The closed-loop telescope/computer position control hardware interface includes quad optical [SHAFT] encoders that provide better than 14-bit resolution at 19,200 counts/rev for an accuracy of approximately 1 arc minute per encoder count. 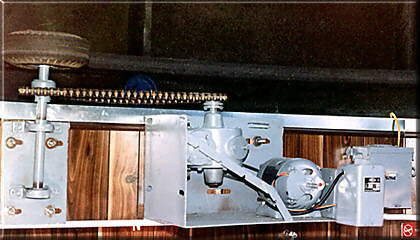 The telescope can be operated manually from keyboard, joysticks, or automatically via computer. OTIS (Observatory Telescope Interface System) is custom written software that provides telescope and observatory operation superior to most larger research observatories. Some of the software features include 1) mount error correction capable of +-1 arc minute pointing resolution 2) manual, database or "script & scroll" auto database telescope positioning 3) dome/telescope sync directional control 4) auto initialization, auto resync, auto spiral search, script database repositioning, manual telescope 5) dome and focus control from keyboard entry. The scope can also be easily controlled in an open-loop mode via commercial software like THE SKY, etc. from any computer's standard serial port.